Tofu is an inexpensive nutrient-rich food. You can make lots of delicious dishes with it. 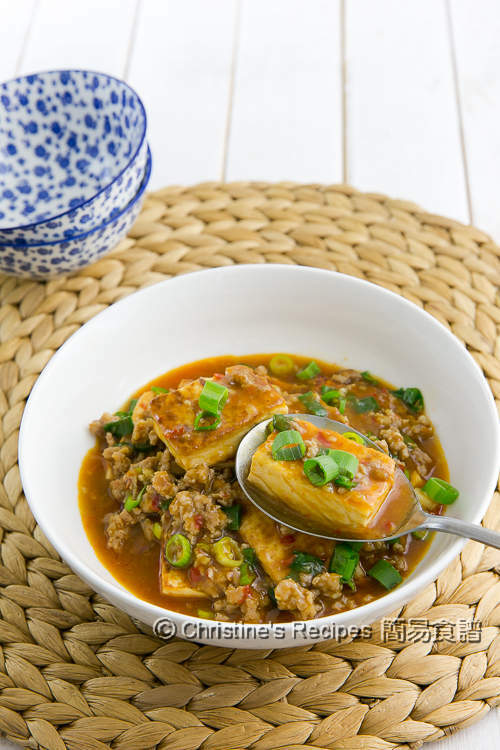 Here’s one of my favourite tofu dishes - tofu and pork in chilli bean sauce (魚香豆腐). The savoury and spicy taste of the whole dish is very appetizing. This dish goes perfectly with a bowl of steamed rice. 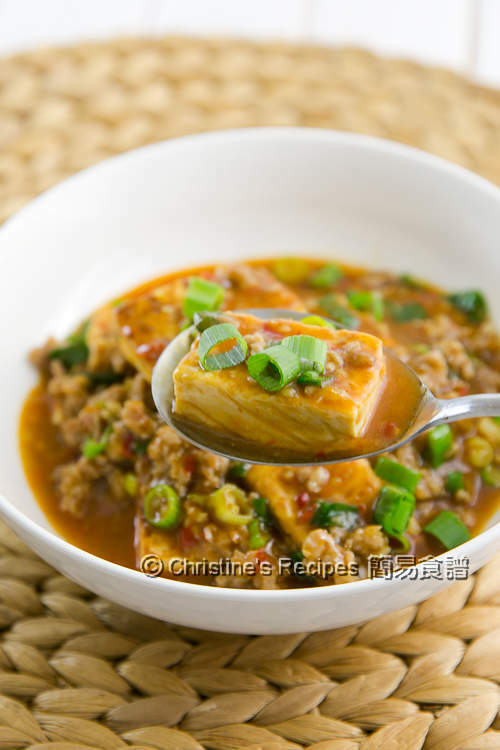 The tofu and pork was braised in chilli bean sauce, doubanjiang (豆瓣醬) that is a spicy, salty paste made from fermented soybeans and broad beans, seasoned with some spices. Here's a video showing how this dish is easy to make. Mix pork with marinade well. Set aside. Absorb the excess water from the tofu with kitchen towels. 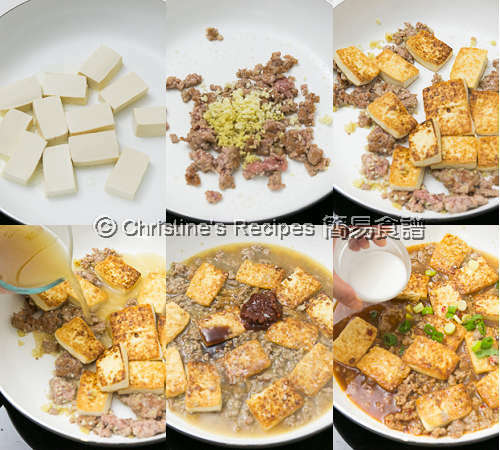 Cut tofu into thick pieces. Season with a little of salt. Pan fry tofu over medium heat until both sides are lightly brown. Set aside. In the same pan, heat oil to stir fry the pork until its colour turns. 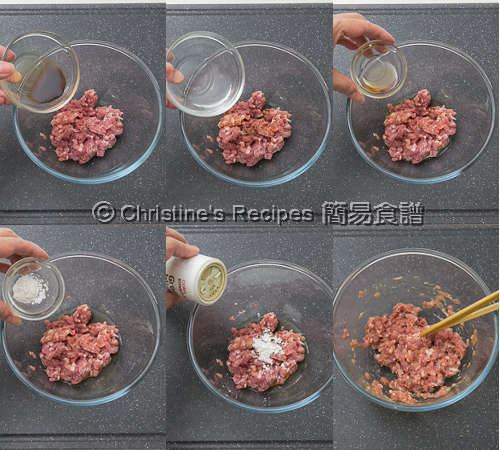 Add minced ginger and garlic. Stir to combine. Toss back the tofu. Pour in chicken stock. Increase heat to high. Bring it to boil. Reduce heat to medium and cook until the sauce is reduced by one third. Add seasonings. Sprinkle spring onion. Stir in the thickening and cook to your preference. It’s done. Serve hot. You may increase the amount of chilli bean sauce if you like a very hot dish. Chilli bean sauce (豆瓣醬) is available at Asian groceries. With a flavoursome sauce like this, I would have to ask for some more rice! YUM!